Note: This article and case study was featured in an archived IWRC newsletter. For additional information or questions, please send us a message. 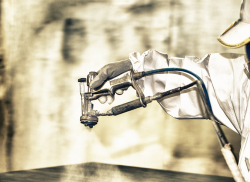 High Volume - Low Pressure (HVLP) spray guns are often viewed as the holy grail of spray painting transfer efficiency (TE). Quite often, HVLP is automatically assigned a generous TE rating of 65% without much (if any) consideration of coating characteristics, spray gun setup parameters, finish quality requirements, and the geometry of the work pieces being coated. In general, any type of spray equipment (including HVLP) is capable of being used inefficiently if set up improperly. This is largely how conventional air spray equipment has developed such a bad reputation for transfer efficiency (generally considered to be 50% at best). Don't get me wrong, HVLP spray equipment definitely offers some impressive benefits in certain applications and if used properly. It does, however, have its share of limitations. Most notably, it lacks the energy needed to sufficiently atomize high viscosity (i.e., high solids – low VOC) coatings. In an effort to remedy this, particularly in situations where HVLP use is required, a spray operator may reduce the coating’s viscosity by adding solvent. This quickly negates the environmental benefit of high solids – high-performance coatings. Optimal efficiency (in any type of coating application) is most effectively and readily achieved by the proper selection, set up, and operation of spray equipment. This, of course, is complemented by the ability to recognize and diagnose application problems. If this article has sparked any interest on how proper spray gun selection and setup might benefit your coating operation, you might be interested in reading a case study the IWRC conducted. It compares the application efficiency and finish quality of pressure-fed HVLP and conventional air spray equipment, using spray gun operating conditions deliberately set up for performance. The findings may surprise you. For higher viscosity coatings, conventional air spray guns may be used just as efficiently as HVLP spray guns if they are properly set up and operated. From a finish quality perspective, conventional air spray equipment may be the best choice for high solids/viscosity coatings and production rates. The higher atomization energy levels available to conventional air spray equipment make it better suited for atomizing high viscosity coatings at higher fluid delivery rates. Consequently, conventional air spray guns may produce the desired finish when spraying high performance, high viscosity coatings in a production environmental while the finish produced by an HVLP air spray gun may fall short of expectations. This may be achieved without sacrificing TE. Findings suggest that HVLP's reputation for TE may simply reside m the fact that its design lowers the ceiling for excessive setup parameters, a particularly beneficial attribute when spraying easily atomized coatings. That is, when compared to conventional air spray, HVLP design restricts the degree to which operating parameters (i.e., fluid and atomizing air pressure) can be set to excessive levels. While advantageous for low viscosity or easily atomized coatings, this attribute puts HVLP at a disadvantage with more difficult-to-atomize high-performance coatings. To see the methods, procedures and findings reference above, read the full case study here.